Defense Minister Moshe Ya'alon (Likud) announced on Friday morning that he is quitting politics, following Prime Minister Binyamin Netanyahu's decision to hand his portfolio over to Yisrael Beytenu head MK Avigdor Liberman so as to bring his party into the coalition. "This morning I let the Prime Minister know that due to his conduct and recent developments, and due to a lack of confidence in him, I am resigning from the government and from the Knesset and taking a timeout from political life," said Ya'alon. Ya'alon's resignation is particularly dramatic as Liberman has not yet formally been given his portfolio as Defense Minister, and there had been speculation that Ya'alon would be named Foreign Minister in exchange. On Thursday night Netanyahu spoke with Ya'alon on the phone and told him that "nothing is determined yet," but apparently Ya'alon was not willing to wait it out and be replaced. His resignation comes after Opposition head MK Yitzhak Herzog (Zionist Union) invited him to join his leftist party on Thursday night. Ya'alon's resignation will bring Temple Mount activist Yehuda Glick into the Knesset as an MK, given his placement on Likud's Knesset list. Glick survived an assassination attempt by an Arab terrorist back in October 2014, miraculously recovering after being shot four times at point blank range. Glick told Arutz Sheva in response to the news: "I pray to God that He give me good counsel and accompany me as an emissary for the nation of Israel, to sanctify the name of Heaven and to increase peace and light in the world and work to unify the nation of Israel." The outgoing Defense Minister is to give a press conference at 12 p.m. at Hakirya governmental complex in Tel Aviv. A senior Likud official on Thursday harshly criticized Ya'alon for his conduct that he said harmed Likud, indicating the growing hostilities between the minister and those in his party. 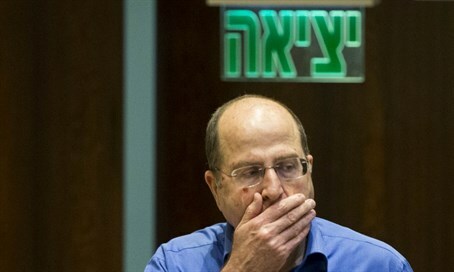 The tensions heightened during Ya'alon's recent faceoff against Netanyahu, when the Defense Minister supported IDF Deputy Chief of Staff Yair Golan who compared Israel to Nazi Germany at a Holocaust Remembrance Day ceremony, and told IDF officers to give their personal opinions regardless of whether they countered the policy of the political echelon. Ya'alon responded for the first time to his imminent replacement on Thursday, when he struck out at Netanyahu for losing his "moral compass," without referencing the Prime Minister by name.